Now, in Portland, I discussed publishing with Pat. Since our last meeting he had released two audiobooks, and he very casually threw around terms like “so easy,” and “no-brainer.” I thought to myself: Yes, this is just the thing for me. 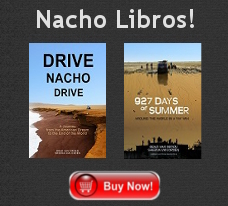 I shall turn Drive Nacho Drive into an audiobook. It will be an easy no-brainer! Flash forward to me sitting in my mother’s closet. I had decided that it would be the perfect recording studio: quiet and private, where I could read our book aloud into a sleek recording device, free from the burdens of self-consciousness and social engagement. I had lined the shelves with pillows to absorb sound. I had crammed a big puffy chair in there. I had sealed the crack under the door with socks. It quickly became stifling, because my mother lives in an uninhabitable desert environment and I had hermetically sealed myself into a tiny closet. But in that cramped, sweaty closet I read and I read, for three straight days, ten hours per day. My voice became hoarse and soon fell victim to acute vocal fry. It didn’t bode well for my audiobook goal. I sounded like a howler monkey. And furthermore, I couldn’t seem to go more than a few seconds without messing up. When finally I emerged from my mother’s closet, I wanted to harm Pat Schulte, for he had sold me a pack of lies! But alas, the wounds healed, my vocal fry smoothed out, we loaded up Nacho and our cat, and we moved to Seattle. Meanwhile, Pat and Ali escaped to Mexico, avoiding my wrath. There is more to say, but I think I have summarized it well. Finally, after much procrastination and internal conflict, I convinced myself to sit down and edit the thirty hours of audio that I had captured on my sleek recording device. I put on big headphones like the sound engineers do, and I looked at all of the waveforms on my screen. I deftly manipulated them, bobbing my head like a DJ as my fingers danced across the keys. And after my first twelve hour day of audio engineering I cracked my knuckles, took a swig of beer, sat back and savored the sweet fruit of my labor through the headphones. All twenty minutes of it. I quickly tapped out an impromptu cost-benefit analysis. Pat was way off base here. This was neither easy, nor a no-brainer. I shelved the remaining 29 hours and 40 minutes of audio and made a spitting sound in disgust. If the people wanted to know what had happened out there, they would just have to read about it for now. Which brings me, finally, to the subject of this short announcement: our second book. After a period of recovery, Sheena and I decided that it was time to write the follow up to Drive Nacho Drive, which, as you will recall, was our first book, and was about driving Nacho from Arizona to Tierra del Fuego. That part of the trip had taken 13 months, and we had published the book while we were in Thailand. But then we proceeded to drive all the way around the world–for 17 more months–from the east coast of Asia to the west coast of America. There was much left to tell! 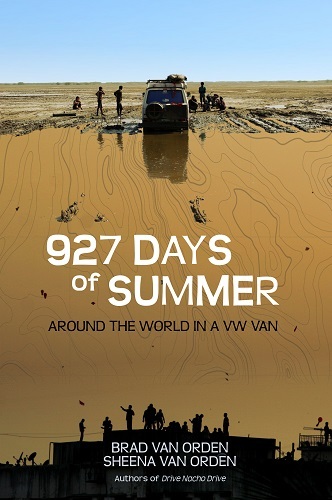 Over the course of several months following our relocation to sunny Seattle, I more or less became a hermit, squandering what could have otherwise been a healthy and fulfilling social life, to write 927 Days of Summer. Despite becoming known as a “flaky guy,” and always being reminded of how red my eyes looked, the process was deeply fulfilling. There were so many things that we wanted to convey during our trip, but which were ill-suited for a blog format, and this gave me a chance to put it all down. The result is something Sheena and I are very proud of, and we’re both really excited to birth it into the world. So here it is! Please enjoy! And when you’ve finished reading it we would be eager to hear what you thought of it. We’ll be looking for you guys at Overland Expo. I’ve enjoyed reading about your travels. Brad, that is awesome. I have only one question about the e-book: How are photos treated? I mean, do you have tons of photos from the blog (or in addition to), that are embedded in the e-book? This is relevant to me, because I use the black and white e-ink Kindle. Looking at photos on my traditional Kindle is a bit like looking at a wedding album sent via fax. With regards to audiobooks, one of my favorite book series (Trader’s Tales From The Golden Age Of The Solar Clipper) by Nathan Lowell started life as a self-narrated audio book on Podiocast. It was fantastic. Sure, the audio quality varied a lot from chapter to chapter, but it steadily improved and by the second book, was pretty good. But the best part was the tone and inflection of the story telling that the author brought to the narration. It was HIS story, so he knew exactly how to tell it. It made the experience a richer, deeper dive into the story, and was very enjoyable because of it. Don’t give up on the audio book! Upon further thought, who cares? I bought it anyway. I can always open it on my computer if I want to dive into any photos. I look forward to starting it this weekend! @nwoods, you’re in good shape, don’t worry. I grayscaled the photos anyway, and then optimized them for viewing on B+W screens. There are 4 photo insert sections in all, so you won’t be tripping over photos while you read. Can’t wait – will you have them at Overland Expo next week? @Derek, yes, we’ll have a bunch of them at the Expo. See you there! Do you view the closet experience as a return to womb? Can’t wait for the audio book pics! Excited to read this but will have to wait a bit before I have the $ to buy it. I very much enjoyed your first book! The clothes in my closet never have quite recovered from the slight smell of my son’s sweat. But fear not: this is the smell of sweat only a mother could love! Brad’s total devotion to this attempt at an audio version of his book is yet another testimony to his drive (pardon the pun) and passion he demonstrated throughout his and Sheena’s nearly 3-year journey. So proud of you, Brad and Sheena! Brad, lookin forward to visitng you guys at OV EXPO. Will be nice to put a live person with the Blog! Great meeting you guys at OE. Can’t wait to crack open the book that we bought! Apologies for telling Sheena that the photo class was at 3:00 when it was actually at 1:00. Let me know if she wants the handouts! Have read both books and thoroughly enjoyed both. Oh to be young again and be able to do what you did. I wonder what your next adventure will be? Reread keeping nacho alive. Nice review of the systems. Your battery did so well. What battery did you use? Hoping you are on the road again soon.